Place your yarn in this richly stained mango wood bowl and keep it from running away. The spiral cutout and three holes not only form an attractive design, but they also give you options for securing your yarn, even using multiple strands. The striking stain gives a dramatic, modern look. 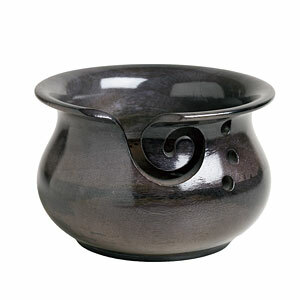 This is a tapered bowl with a flared opening; top and widest middle 6" diameters, narrowest point is 4.5" diameter. Very rough - cannot hold yarn through the swirl at all as it snags and damages it and won't even go through. Can be used for the center of the bowl itself but make sure the bowl is well below you and the yarn is something tough like acrylic, cotton, or perhaps a rough and high twist 'highland' type yarn NOTE FROM KNIT PICKS: I am sorry to hear that your yarn bowl has some rough spots. It should be completely smooth. Please call our Customer Service at 1-800-574-1323 and we will be happy to take care of it for you. This bowl is a gift and it looks more beautiful than the picture. I am very pleased. Hope the recipient will be as well!